Impressionist music was often dreamy in nature and this piece fits right in that category. The dreamy quality of the melody is achieved using the whole tone scale. Whole tones on guitar are achieved by skipping on fret each time you advance on the neck. On piano you would skip one key(whether black or white.) There are only two whole tone scales….think about it??? 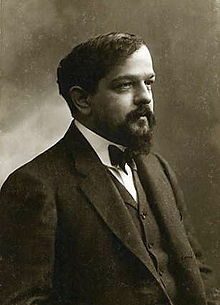 Debussy achieves the lush sonority with his orchestration in the strings and his use of tall chords…chords with extensions, 9, 11, 13s etc. The sound of the harp also adds to the piece’s calmness. The video again has an amazing animated score which may visually help you enjoy the music so try and follow along!